WE spend a huge part of life in situations that require negotiation, whether with members of our family (“Can we have a dog? ), clients (“We need to move up the delivery date”), employees (“I’d like a raise”) or our bosses (“We need you to relocate”). Along the way we have learned, often the hard way, to develop some negotiation skills. But formal training is rare — and, if it occurs, is usually limited to one brief course. A handful of new books, either in bookstores now or coming soon, is aiming to fill the void. The best of the bunch, “The Power of a Positive No”(Bantam, $25), is by William L. Ury, director of the Global Negotiation Project at Harvard. Mr. Ury was also a co-author of “Getting to Yes,” a book written to help both sides feel good about the outcome of a negotiation (a concept that has been reduced to the annoying catchphrase win-win). His new book should be seen as a prequel. Like its title, the premise is not intuitive, but it does make sense once you think it through. Mr. Ury believes that people often end up unhappy with the outcome of a negotiation because they do not recognize what is truly important to them in the first place. So the first step, before responding to the other side, is to determine what you value. If spending time with your family is important, for example, acknowledge it to yourself. Then, if your boss asks you to postpone your vacation, you can respectfully — and Mr. Ury is a huge believer in showing respect to the other side — decline. The book is far heavier on family and interpersonal negotiations than some business readers may want, and the constant references to Mr. Ury’s apparently precocious young daughter become somewhat cloying. More troublesome is Mr. Ury’s assumption that the people with whom you will negotiate will be more or less rational. Still, the book does an excellent job of explaining his argument, especially the need to be clear about what you really want. That is the same starting point that Michael C. Donaldson, an entertainment lawyer, uses in “Fearless Negotiating” (McGraw-Hill, $16.95), although he takes a much more nuts-and-bolts approach. This thin, breezy book has a Negotiating 101 feel to it. For example, Mr. Donaldson goes out of his way to define basic business terms like profit and markup. You would probably want a few more details from him before you used this approach to try to solve a border war or negotiate a consent decree with the government. But he is good at explaining how to go about each step in his process. For example, in the wish stage, he says, no idea is off limits when you begin imagining what success might be. But he stresses that you should reduce your dreams to a handful before entering a negotiation. R. Donahue Peebles, a real estate developer and author of “The Peebles Principles”(Wiley, $24.95), also isn’t big on theory. And as you can tell from the title of his book, he doesn’t have a problem with tooting his own horn. But if you can get past the rambling style — the book tends to make a point, launch into a digression involving name-dropping, only to return to the point — he does provide specific tactics to keep in mind during negotiations. And much more than the other two books, this one emphasizes that you understand the people with whom you are negotiating. “You have to figure out what’s motivating the people on the other side of the table,” he writes. “Once you do, then you have to figure out how to give it to them,” in a way in which you benefit. Not surprising, it sounds as if win-win is the way to go. 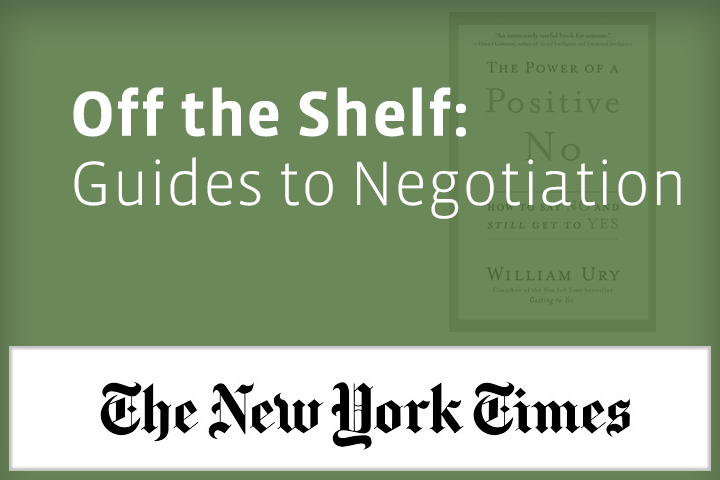 No Replies to "Off the Shelf: Guides to Negotiation (With the Boss or a Child)"